Two of the UK's five districts with the highest percentage of people which backed Brexit were in Essex, figures show. In Castle Point 72.7% of the electorate voted to leave, while in Thurrock the figure was 72.3%. Every district in Essex has voted to leave the European Union in what Nigel Farage has called "Britain's Independence Day". The county turnout was 999,283 - more than 75% - with 62.3% voting Leave. The other three districts with the highest Brexit vote were Boston (75.6%) and South Holland (73.6%), both in Lincolnshire, and Great Yarmouth (71.5%) in Norfolk. Uttlesford had the highest Remain share in Essex with 49%. Clacton's UKIP MP, Douglas Carswell, tweeted a photo of the Vote Leave campaign office saying: "Yes we did!". Five of the county's 18 MPs had said they wanted to remain in the EU, with the remainder saying they wanted to leave. Every area in Essex voted out and 62% of the county backed Brexit. 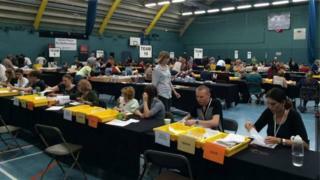 Despite the rain, thunder and floods yesterday, turnout was significantly higher than at the last general election - it was 80% in Brentwood and Uttlesford. A large majority for Leave in Essex was anticipated. Many will be cheering and some will be partying today. But there were 376,371 people who voted Remain. Since then, they've travelled to work, taken the kids to school, or gone to the supermarket and worried about what their future holds. Harlow's Conservative MP Robert Halfon said "the people had spoken" and it was a "wake-up call to do what the people want us to do". Pro-Leave Conservative MP for Harwich and North Essex, Bernard Jenkin, said Chancellor George Osborne needed to "start being reassuring" to stablise markets following Britain's decision to leave the EU. "The markets are responding to what the Chancellor's told them is going to be a terrible thing," Mr Jenkin said. "He's got to change tack very quickly and say 'I was wrong, there isn't going to be an earthquake, there isn't going to be a plague of frogs' - he needs to start being reassuring, otherwise he'll be out of a job." Labour MEP Richard Howitt, who had campaigned on behalf of Remain, said: "We have to accept that we live in a democracy and respect the rules of the game. "I don't believe, however pro-European I may be, that could ever trump the decision of the people in an elected vote." Witham's Conservative MP and Leave supporter Priti Patel said she was saddened to see David Cameron announce his resignation. "His statement was dignified and honourable and he deserves great credit for the character he has shown," she said. Of the referendum result, Ms Patel said: "Hope has prevailed over fear and we now have a huge range of possibilities ahead of us as we embark on a new chapter in our country's history." Stephen Metcalfe, MP for South Basildon and East Thurrock, said: "I am pleased the UK has voted to start the process of leaving the EU and look forward to us taking back control over our own destiny. "This is a momentous moment in our country's history and one which I believe presents us with many opportunities. There will be many hurdles to overcome over the coming months, but as I have always said I am confident we can meet any challenges that come our way and that the UK has a bright future outside the EU." Get the results in full.